HTHW Leak FindIR™ - Stockton Infrared Thermographic Services, Inc.
High Temperature Hot Water (HTHW) distribution systems carry very hot water from building to building for the purpose of heating domestic water and supplying heat to buildings. Very similar to steam heating systems, there are many opportunities for energy savings. The distribution system should supply high-quality hot water to the end-use equipment at the required rate and pressure, and with the minimum heat loss. Even from high altitudes, HTHW line inspections are one of the easiest applications for our aerial infrared thermographers. 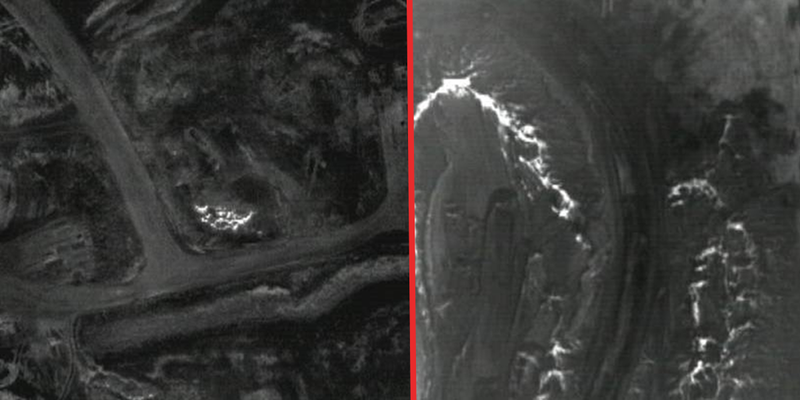 Thermal contrast between active lines and the surrounding ground are usually very good. 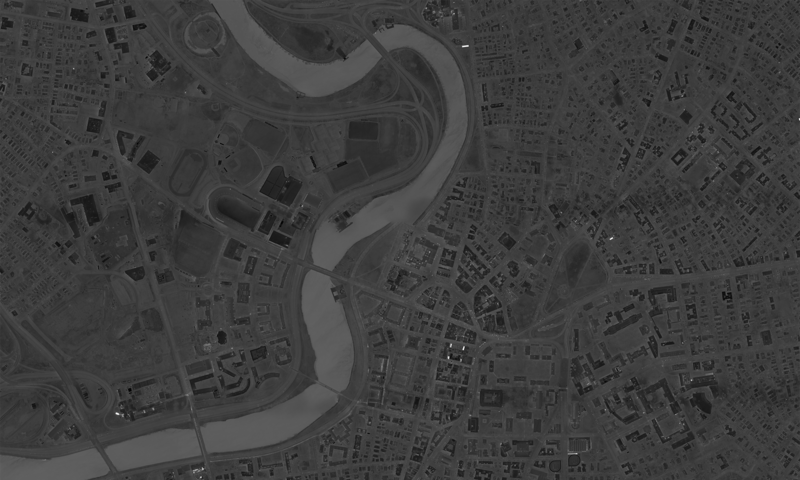 The entire system can be flown and areas with problems pinpointed and documented. Steam is used to heat buildings, heat raw materials and finish products in manufacturing and to generate electricity. Steam is not free. There are many opportunities for energy savings. In the US, It costs approximately $20 billion dollars annually to feed the boilers generating steam alone. A steam system consists of generation, distribution and recovery. In other words, the boilers, the distribution system and the condensate return system. The purpose of an effective steam distribution system is to link the output of the steam generation system to the steam end-use equipment. The distribution system should supply high-quality steam to the end-use equipment at the required rate and pressure, and with the minimum heat loss. The purpose of an effective condensate recovery system is to make the most effective use of all remaining steam and condensate energy after process end-use. 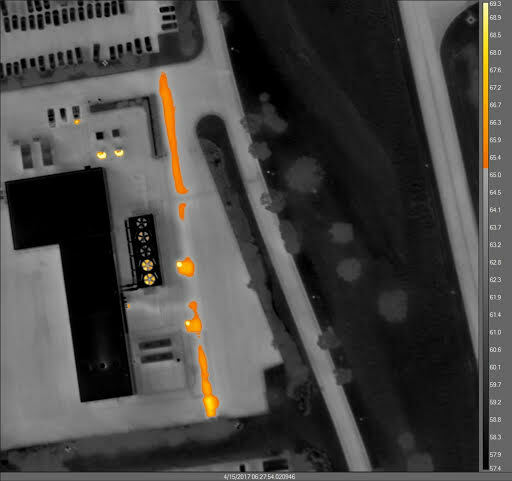 How can Aerial Infrared help? 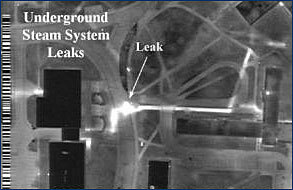 Checking the boilers and the lines in the steam tunnels are jobs done on the ground, but the distribution and condensate return lines that are direct-buried are best surveyed from the air. 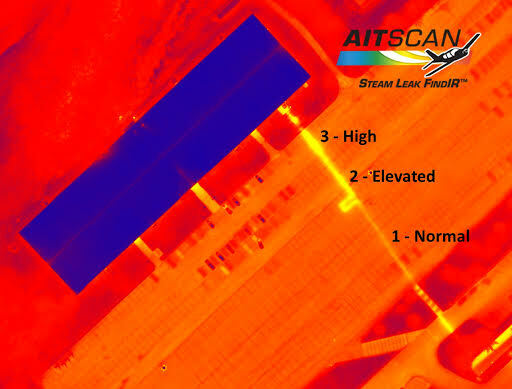 In fact, even from high altitudes, steam line inspections are one of the easiest applications for aerial infrared thermographers. Thermal contrast between active steam lines and the surrounding ground are usually good. 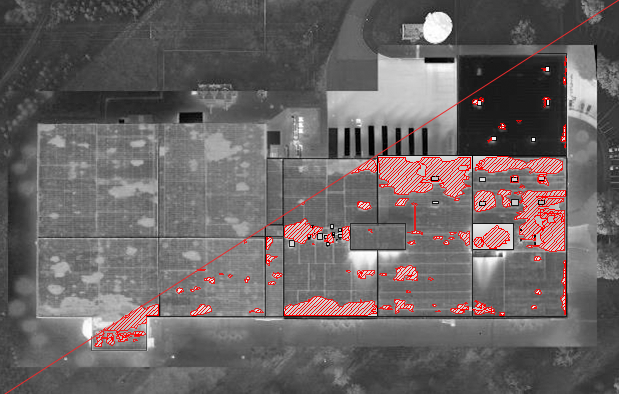 The entire system can be flown and areas with problems pinpointed and documented. Visit the HTHW Leak FindIR™ website here!